Riding an ebike has many benefits which can be summarized within two categories: improving your health and saving money. Moreover, besides these benefits for the individual, there are many advantages for society at large. An ebike has in common with a normal bike all the benefits for the body and the mind that those who ride regularly know very well. With an ebike you have the advantage of being able to choose more precisely the level of effort that you prefer. If you are riding to the office, or you are coming back from the supermarket carrying heavy loads, you can choose to have the electric motor help you; you are still exercicing your body, though less intensively than you would on a regular bike, which allows you to reach your office or home without sweating. This kind of effort is ideal for those who want to begin some form of physical exercice to get back in shape, because it is very gradual and it does not stress the joints. How many times have we decided to start a regular plan of physical activity on a normal bike, only to leave it home after a few days, when the initial enthusiasm has waned? An ebike, because it helps you make a more regular and less intense, but still healthy exercice, motivates you to be more persistent in the long term. The pull of the motor can be felt especially at those times when a greater effort would normally be required, for instance when restarting after a red light, or when pedalling uphill. The feeling is that you constantly have a favourable wind at your back helping you along. Those who on the other hand want to push hard and train to reach their limits can still do it: they will just go faster. Moreover, riding a bike can also be lots of fun, as every kid knows. 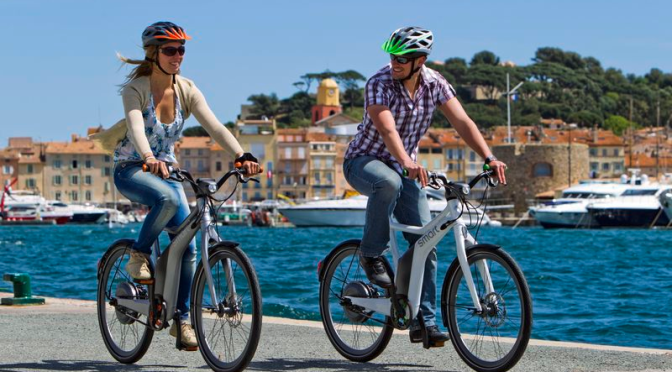 Ebikes can help everybody to pedal more often and improve their quality of life. You will be able to rediscover the feeling of the wind in your face, and give life back to the city streets now suffocated by the traffic. Using an ebike can also bring many benefits to society as a whole. An ebike does not pollute the air: it has no toxic emissions, and it is silent, helping to reduce acoustic pollution. An ebike needs much less room than a car, helping to free the streets from traffic jams and wild parking. If everybody used a bike to move within our cities, they would be much more vivible. Ebikes allow many more people to do so, even in situations where they wouldn’t because of old age, physical problems, or steep ascents. Let’s also think of cargo ebikes: with these it is possible to move up to 300kg. The delivery of small packets within our cities could be revolutionized in this way, getting rid of heavy and polluting trucks. Ebikes can in some instances also be safer than normal bikes. Ebikes have a very low maintenance cost. Charging an ebike battery costs only a few cents. Moreover, in most countries ebikes are not subjected to the taxes and regulations necessary to drive a car. Let’s think of a standard family with two cars. Replacing the second car (which is in most cases used just for short trips in town) with an ebike would allow them to save thousands of euros or dollars per month. Moreover, reparing an ebike, should it ever break, costs much less than reparing a car. If you choose to install an ebike kit on a bike you already have, you can also save on the initial cost (though we prefer to say “investment”) of buying an ebike. On the other hand, you have to take into account the cost of replacing the battery, typically every two or three years; though batteries are not cheap, this cost is widely offset by all the other savings we have just mentioned. Read also our ebike buyer’s guide.